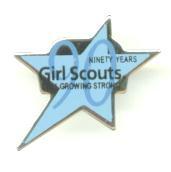 Girl Scout Week began in October 1933, honoring the birth of Juliette Low. GSUSA offered small items to celebrate the week. In 1955 Girl Scout Week was moved to March to honor the official first day of Girl Scouting in the USA. Pins, Charms and other items celebrating the milestones in Girl Scouting history reflect the design influence and the concerns of the times. 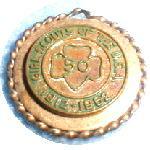 The 50th pin shows the traditional trefoil of the Girl Scouts, a simple understated design. The 60th pin shows the influence of modern design, relegating the GS to small lettering. Ecology and water, water, water was the focus during the 70th anniversary. 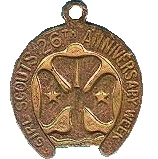 The 75th was the diamond jubilee of Girl Scouting and celebrated the resurgence in the popularity of Girl Scouting. 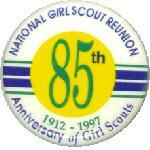 The 85th allowed time to refocus on the familiar saying "Once a Girl Scout, always a Girl Scout". Local department stores that were official Girl Scout outlets gave free gifts to Girl Scouts during Girl Scout Week. This encouraged girls and their parents to visit the department store and was a very popular promotion from 1933 until the 1970s. Many items were offered for the 50th Anniversary including a cast iron trivet.